We had such a great Christmas! Ridiculously busy..but great. The most unexpected part of Christmas was that Chase and I have been joking recently about how this (living in Colorado) is our chance for a white Christmas and we were giving that up to go home. (once again...joking). We get to Texas on Wednesday and it is literally HOT. 70 degrees and humid. We were seriously sweating. Next day? SNOW! in Texas! So, needless to say, we had a white Christmas, after all. 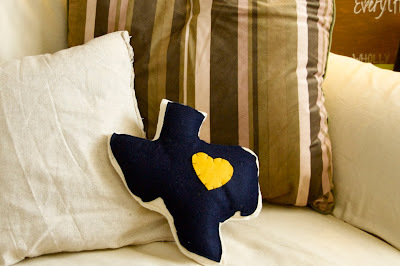 I'm missing Texas already...so i made this little cutie this morning.